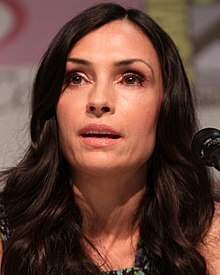 Famke Beumer Janssen (Dutch: [ˈfɑmkə ˈbøːmər ˈjɑnsə(n)]; born c. 1964) is a Dutch actress, director, screenwriter an umwhile fashion model. She played Xenia Onatopp in GoldenEye (1995), Jean Grey / Phoenix in the X-Men film series (2000–2014), Ava Moore on Nip/Tuck an Lenore Mills in Taken (2008) an its sequels, Taken 2 (2012) an Taken 3 (2014). ↑ "Famke Janssen- Biography". Yahoo! Movies. Archived frae the oreeginal on 5 August 2012. Retrieved 23 December 2012. ↑ College Tour: Famke Janssen kijk je op. npo.nl. 26 September 2014. Event occurs at 30:36. Retrieved 26 January 2015. ↑ "Famke Janssen Biography (1964?-)". FilmReference.com. Archived frae the oreeginal on 3 March 2016. Retrieved 2 May 2016. ↑ Shattuck, Kathryn (17 February 2017). "Famke Janssen Plays Another Lethal Woman in a 'Blacklist' Spinoff". The New York Times. Retrieved 25 February 2017. So how old are you? ... I’m 52. This page wis last eeditit on 27 Mey 2017, at 04:23.